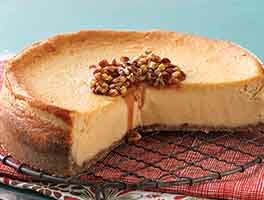 This "Creamsicle®" cheesecake features vanilla extract plus Fiori di Sicilia and orange zest, giving it wonderfully bright flavor. It's perfect topped with summer fruit. To make the crust: Whisk together the flour, almond flour, confectioners' sugar, and salt. Mix in the butter until evenly crumbly. Press into a 9" to 10" springform pan, pushing firmly up the sides. Prick the bottom of the crust all over with a fork. Chill in the freezer, uncovered, for 15 minutes or so, while you preheat the oven to 375°F. Remove from the freezer, and bake for 14 to 16 minutes, until the crust is lightly browned at the edges. Set aside to cool while you make the filling. To make the filling: Slowly mix the cream cheese and sugar until well blended, scraping the sides and bottom of the bowl. Mix in the eggs one at time, then the cream, flavorings, and zest. Pour the filling into the baked crust, and reduce the oven heat to 325°F. Bake for 50 to 55 minutes, until the cheesecake is set around the edges (a 4" to 5" circle in the center will remain soft). Turn the oven off, prop the door open, and let the cheesecake sit for an hour. Run a knife or spatula around the edges. Cool for several hours. Just before serving, top as desired. 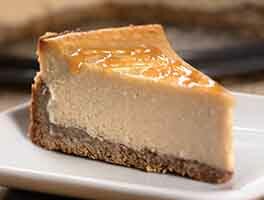 To make plain vanilla cheesecake, omit the Fiori di Sicilia, and increase the vanilla extract to 1 tablespoon. This was a very thin batter and was disappointing. My experience with cheesecakes is this had too many eggs. If you want the eggs to give a light and fluffy texture, whip them to soft peaks and then fold into the batter. That might work better. It baked just fine and puffed up nicely. When it cooled it collapsed. The taste was not worth the ingredients. Sorry. Back to my tried and true cheesecake recipe. I have been making this recipe on a regular basis since 2009. I do add more Fiori di Sicillia & Vanilla. People LOVE IT SO much they ask me to make it all the time. I LOVE KING ARTHUR FLOUR! I wish I had the same connection to get my 50 lbs of flour here in Clearwater FL that I had back in Rochester NY. This was good, but I'm curious why the recipe has 5 eggs. Most cheesecake recipes I've tried have a 1 egg per block of cream cheese ratio. I made it as written and with less eggs. I preferred the version with less eggs. I baked this cheesecake today for my husband's birthday, with a couple of additions to the recipe to up the flavor just a little bit. I first mixed the orange zest into the sugar and let it sit for a while to flavor the sugar before mixing it in with the cream cheese. I had a vanilla bean, so I scraped the caviar into the sugar to boost the flavor a bit. I also replaced 1/4 cup of the flour in the crust with an ultra black cocoa powder to make a chocolate crust. It would have been great as written, but the resulting cheesecake with the additions was amazing!!! Baked this cheesecake for a birthday instead of a traditional birthday cake and it turned out beautiful!!! It has a rich, creamy taste and I used fresh almonds in the crust which I ground myself. I used lemon zest thinking the "orange" might be overwhelming, so I don't think it tasted very much like a creamsicle. But everyone loved it none the less and I am definitely going to make it again! 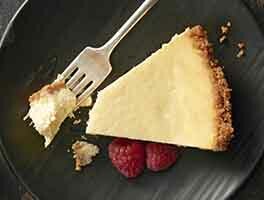 This is one of my favorite cheesecake recipes! I love the almond crust and I grind fresh almonds rather than use an almond flour as this give a bit for crunch to the crust. I have made many variations on this basic recipe and every one asks me to make it over and over again. I cannot eat commercially prepared or restaurant cheesecake any where any more; nothing else compares with this from my own kitchen. I usually make a topping using mandarin oranges and syrup prepared from orange juice to top it. 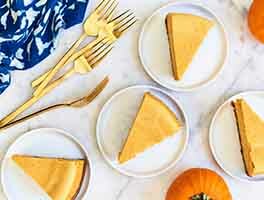 Great recipe and the crust was so easy to move from the bottom of the pan to the serving platter. I did substitute G/F flour in the crust recipe and added one tablespoon of corn starch in the cheesecake recipe as the batter was very loose compared to most other cheesecakes I've made in the past. Wonderful recipe and I'd make it again. 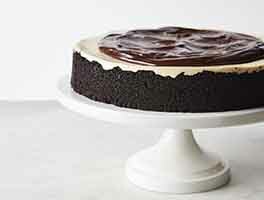 This came out well and was enjoyed by all- not deadly rich or too sweet like commercially made cheesecakes. I did find the crust directiions somewhat unclear. Is the butter supposed to be "cut in"? How thick is the crust supposed to be? The recipe says up the sides? I don't think there is enough to do that. The recipe is easy and should produce great results even for those who aren't experienced bakers. For topping I used sun cooked fruit from Green Briar Nature Center on Cape Cod. This is a wonderful cheesecake. The flavor is outstanding and the crust was just delicious! I did find the cheesecake to be a little soft in the middle. I'd like it more firm (like in the photo). I wonder if I cut down the heavy cream to 1/4 cup or left it out if that would firm it up.